Auckland Wide 24 hours 7 Days! We come to you For a range of full car services for your sedan hatchback 4x4 Call Now 0508 247 273 and book your service with us today! Auckland Mobile Mechanics are a fleet of trained mobile garages, The mechanic that comes to you for all car services and repairs for your car van, ute, 4 wheel drive and more. We welcome all makes and models, to your chosen location Auckland Wide 24 hours 7 days a week! And when your vehicle has broken down at home, work or on the roadside we come to you to help you get you back on the road! Auckland Mobile Mechanics are able to travel to wherever the customer and their vehicle are, and have both the experience and tools to carry out the work required to fit either your Car Servicing, Mobile WOF or Car Repair needs. 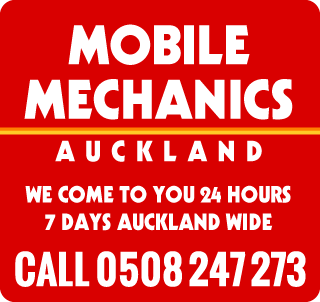 Contact us for your trusted Mobile Mechanics Auckland Wide. Save time and stress, when we bring the workshop to you! Call now 0508 247 273 and Book your mobile mechanic with us today. And if your prefer to book online Click here.